Tiffany's Online Finds and Deals: 40% OFF Everything PLUS FREE SHIPPING at GAP! 40% OFF Everything PLUS FREE SHIPPING at GAP! 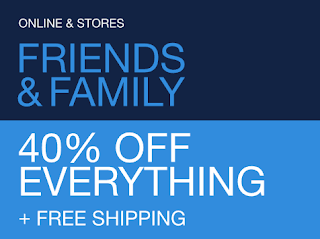 40% OFF Everything PLUS FREE SHIPPING at GAP during their friends and family sale when you use code: FRIEND at checkout! Great time to get some back to school clothes shopping done. BACK TO SCHOOL SALE. ALL KIDS LEGGINGS ARE 15% OFF! CHECK LEGGING ARMY OUT HERE!